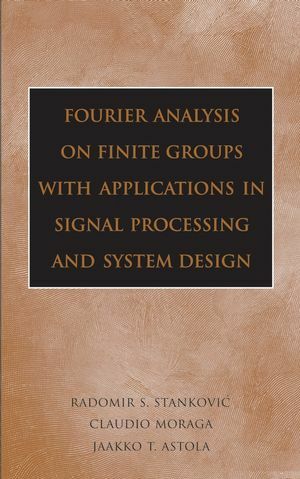 Fourier Analysis on Finite Groups with Applications in Signal Processing and System Design examines aspects of Fourier analysis on finite non-Abelian groups and discusses different methods used to determine compact representations for discrete functions providing for their efficient realizations and related applications. Switching functions are included as an example of discrete functions in engineering practice. Additionally, consideration is given to the polynomial expressions and decision diagrams defined in terms of Fourier transform on finite non-Abelian groups. Among the highlights is an in-depth coverage of applications of abstract harmonic analysis on finite non-Abelian groups in compact representations of discrete functions and related tasks in signal processing and system design, including logic design. All chapters are self-contained, each with a list of references to facilitate the development of specialized courses or self-study. With nearly 100 illustrative figures and fifty tables, this is an excellent textbook for graduate-level students and researchers in signal processing, logic design, and system theory-as well as the more general topics of computer science and applied mathematics. RADOMIR S. STANKOVIC, PhD, is Professor, Department of Computer Science, Faculty of Electronics, University of Nis, Serbia. CLAUDIO MORAGA, PhD, is Professor, Department of Computer Science, Dortmund University, Germany. JAAKKO T. ASTOLA, PhD, is Professor, Institute of Signal Processing, Tampere University of Technology, Finland. 1 Signals and Their Mathematical Models. 1.3 Mathematical Models of Signals. 2.2 Fourier Transform on Finite Groups. 2.3 Properties of the Fourier Transform. 2.4 Matrix Interpretation of the Fourier Transform on Finite Non-Abelian Groups. 2.5 Fast Fourier Transform on Finite Non-Abelian Groups. 3 Matrix Interpretation of the FFT. 3.1 Matrix Interpretation of FFT on Finite Non-Abelian Groups. 3.3 Complexity of the FFT. 3.3.1 Complexity of Calculations of the FFT. 3.3.2 Remarks on Programming Implememtation of FFT. 3.4 FFT Through Decision Diagrams. 3.4.2 FFT on Finite Non-Abelian Groups Through DDs. 3.4.3 MMTDs for the Fourier Spectrum. 3.4.4 Complexity of DDs Calculation Methods. 4 Optimization of Decision Diagrams. 4.1 Reduction Possibilities in Decision Diagrams. 4.2 Group-Theoretic Interpretation of DD. 4.4 Discussion of Different Decompositions. 4.4.1 Algorithm for Optimization of DDs. 4.5 Representation of Two-Variable Function Generator. 4.6 Representation of Adders by Fourier DD. 4.7 Representation of Multipliers by Fourier DD. 4.9 Fourier DDs with Preprocessing. 4.9.2 Fourier Transform for Matrix-Valued Functions. 4.10 Fourier Decision Trees with Preprocessing. 4.11 Fourier Decision Diagrams with Preprocessing. 4.13 Algorithm for Construction of FNAPDD. 5 Functional Expressions on Quaternion Groups. 5.1 Fourier Expressions on Finite Dyadic Groups. 5.2 Fourier Expressions on Q2. 5.4 Arithmetic Expressions from Walsh Expansions. 5.5 Arithmetic Expressions on Q2. 5.5.1 Arithmetic Expressions and Arithmetic-Haar Expressions. 5.5.2 Arithmetic-Haar Expressions and Kronecker Expressions. 5.6 Different Polarity Polynomials Expressions. 5.6.1 Fixed-Polarity Fourier Expressions in C(Q2). 5.7 Calculation of the Arithmetic-Haar Coefficients. 5.7.2 Calculation of Arithmetic-Haar Coefficients Through Decision Diagrams. 6 Gibbs Derivatives on Finite Groups. 6.1 Definition and Properties of Gibbs Derivatives on Finite Non-Abelian Groups. 6.5 Matrix Interpretation of Gibbs Derivatives. 6.6 Fast Algorithms for Calculation of Gibbs Derivatives on Finite Groups. 6.6.1 Complexity of Calculation of Gibbs Derivatives. 6.7 Calculation of Gibbs Derivatives Through DDs. 6.7.1 Calculation of Partial Gibbs Derivatives. 7 Linear Systems on Finite Non-Abelian Groups. 7.1 Linear Shift-Invariant Systems on Groups. 7.2 Linear Shift-Invariant Systems on Finite Non-Abelian Groups. 7.3 Gibbs Derivatives and Linear Systems. 8 Hilbert Transform on Finite Groups. 8.1 Some Results of Fourier Analysis on Finite Non-Abelian Groups. 8.2 Hilbert Transform on Finite Non-Abelian Groups. 8.3 Hilbert Transform in Finite Fields.